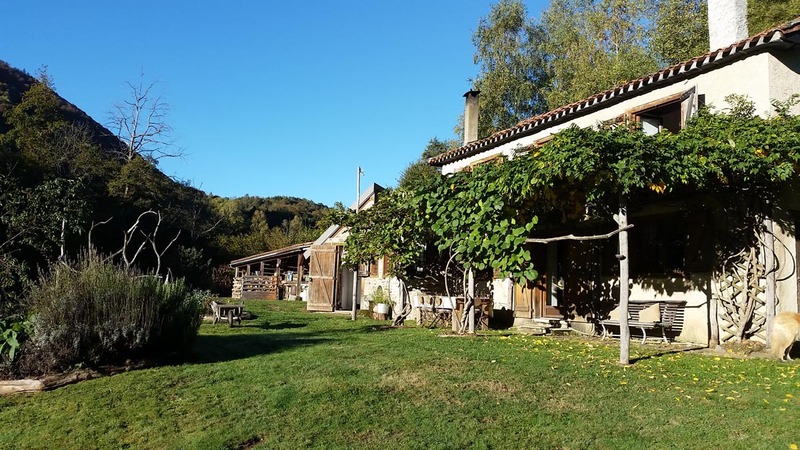 The house is an old stone barn nestled in one hectare of beautiful green land, surrounded by forests and with views of the mountain peaks with its ever changing lights and colours. Situated at 750m altitude and 3 km up a mountain track, it has been renovated with quality materials and is completely off-grid. The mountain track, at times, bordered on either sides by some ancient stone walls has a limited width of 1.90m approx but does not require a 4×4 except in very deep snow which we are still waiting for!! The 1 hectare property is completely fenced off and has 2 streams running through it. One third of it is woodland. 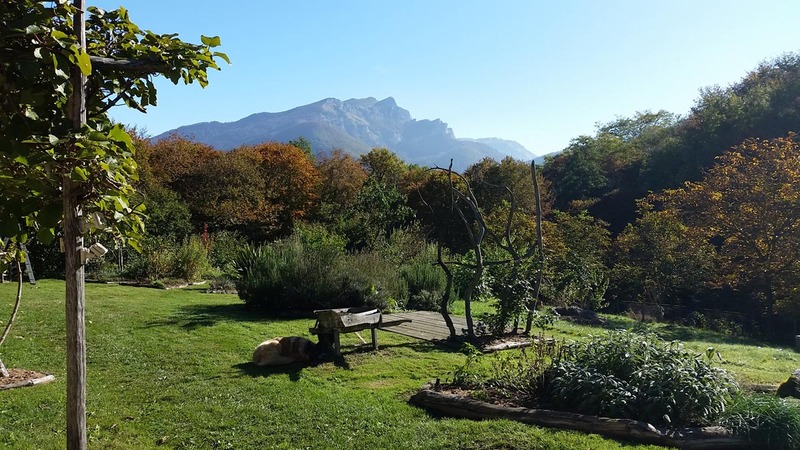 No chemicals were ever used on the land and the garden has been designed and cultivated according to Permaculture principles. 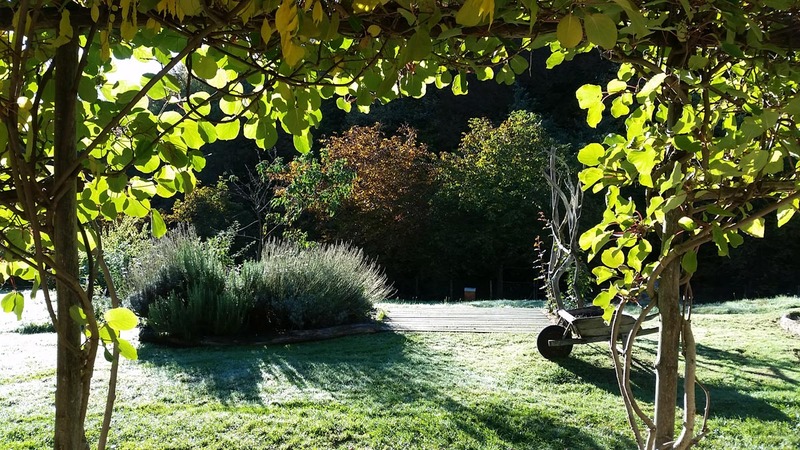 There is a young but established food forest with about 200 trees, shrubs and herbaceous perennial plants (full list is available), 2 large fenced vegetable gardens with raised beds, a 14m x 4m polytunnel with a 1000 litre water tank, and a large chicken house. There is also a 5m diameter yurt with insulated sweet chestnut flooring and wood burning stove that we use as a guest room. The property, surrounded by forest, is teaming with wild life, and is a paradise for hikers, foragers and nature lovers. There are many tracks for mountain biking, hiking, horse riding, donkey trekking, mushroom hunting and more. Although remote, it is only 10 minutes away from a bar/restaurant and a village shop with all amenities. Main shops, schools, banks, dentists, doctors and hospitals, are all within easy reach. Toulouse and Pau airports are 1½ hours away while Tarbes/Lourdes airport is only 1 hour away depending on how fast you drive. There are skiing stations 30-40 minutes away, the main one being Bagneres de Luchon and the Spanish border is only 40 minutes away ideal for a quick tapas lunch! Of course, the Tour de France often passes through some of the villages nearby if you fancy watching it live. This house is quite exceptional in its ability to fulfill your dream of sustainability – in comfort. You could easily forget that it's off the grid!